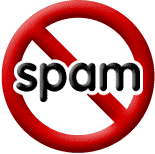 A study conducted by Sophos revealed that a new spam page is placed on the Internet every 3 seconds. This adds up to 20.000 new spam pages per day. These pages are usually placed in a spam e-mail message that sometimes even includes a link to an infected page. Most spam messages originate from the United States (15%), followed by Russia (7.4%), Turkey (5.9%) and China (5.4%). Yet, North America only plays a minor role in the spreading of spam. According to Sophos, this is due to the fact that most Internet users in that region are armed with anti-spam filters and antivirus software. COMBELL customers are not at risk either. As a matter of fact, every hosting account comes with a free antivirus software and anti-spam filter.